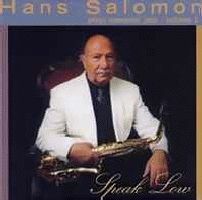 After all these years of Jazz, this is the first Hans Salomon album under his own name. As a living legend of the Austrian Jazz scene he played together with Joe Zawinul in the early fifties, was also one of the founding members of the Austrian All Stars and played several years in the Johannes Fehring Big Band. All his activities in Jazz, like the working with Friedrich Gulda, Fatty George or the Erich Kleinschuster Sextett, the Vienna Big Band Machine and thousand others speak for themselves. Hans Salomon (alto sax) with various musicians (Oliver Kent, Erwin Schmidt, Harald Gansberger, Robert Schönherr (piano), Joschi Schneeberger, Hannes Strasser, Harald Putz (bass) und Walter Grossrubatscher, Mario Gonzi, Karl Prosenik (drums)) and Anna Lauvergnac, Lady P., Jacqueline Patricio (vocal).